The Fairfax canister vacuums are powerful machines that have been around for years. The body and motor of the Fairfax vacuum cleaners were designed by NASA to withstand years of use and provide ultimate filtration. Today, Fairfax vacuum cleaner bags are manufactured by 3rd party companies including DVC and EnviroCare. 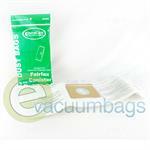 Choose from the Fairfax paper bags shown below for your Fairfax canister vacuum cleaner. For best performance, replace original Fairfax bags when 3/4 full. The life and health of your machine is affected not only by the quality of filter bags you use, but also by the frequency with which you change them. The bags are a critical part of keeping dust out of the motor, while airflow, which is affected as a vacuum bag fills, directly impacts suction power while vacuuming. 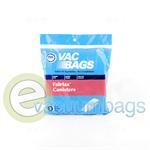 EnviroCare Micro Filtration Paper Vacuum Bags for Fairfax Canister Model Vacuums. Generic DVC Paper Vacuum Bags for Fairfax Canister Vacuum Cleaners.